Who: The Superior Court of California, County of San Bernardino Justice Center dedication ceremony will include remarks by California Chief Justice Tani G. Cantil-Sakauye, Presiding Judge Marsha G. Slough, Assistant Presiding Judge Raymond L. Haight, III, and Court Executive Officer Christina M. Volkers. When: Thursday, May 1, 2014, 10 a.m.
What: The program will include remarks, dedication of the building, and recognition of donations. Where: The new justice center is at 247 West Third Street, San Bernardino, CA. The ceremony will take place in the new building’s parking lot. Why: The grand opening celebrates completion of more than seven years of planning, design, and construction for the new San Bernardino Justice Center in downtown San Bernardino. The courthouse, which has 35 courtrooms and two hearing rooms, will consolidate operations from several overcrowded and functionally inadequate facilities. 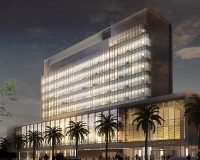 The new 11-story structure occupies a 7-acre site donated by the City of San Bernardino, directly across from the historic courthouse, which will continue to be used for family law proceedings. The modern facility will better serve the needs of the county’s growing population. It will also provide improved seismic safety and security operations, with a secure sallyport for transportation of in-custody detainees, and will be fully accessible to people with disabilities. Designed by Skidmore, Owings & Merrill LLP and built by Rudolph and Sletten, the new justice center hosts a spacious entrance lobby that allows for ample daylight while limiting heat gain. A multi-story atrium connects the administrative, three-story base with the eleven-story tower where courtrooms and judicial offices are located. The building’s orientation and façade design help to mitigate the harsh desert environment. Innovative stormwater management strategies and an overall reduction of energy use by 23 percent and domestic water use by 51 percent qualify the project for LEED Silver certification by the U.S. Green Building Council. The court is expected to be open for business on May 12, 2014. More information about the project is on the California Courts website at www.courts.ca.gov/facilities-sanbernardino.htm. This event is open to the public. Those needing accommodation due to a disability, such as an assistive listening system or a sign language interpreter, are requested to contact the ADA Coordinator at 909-708-8747 at least 48 hours in advance of the event. Members of the media wishing to attend the ceremony should send inquiries to rsvp@sb-court.org.